If one more person posts their plan for a nuclear bomb attack…It makes me sick and afraid. It’s hard to believe that is actually a real concern taking up brain and heart space of some people. The world got really scary this week with the ‘mother of all non-nuclear bombs’ dropped on ISIS and gay concentration camps in Chechnya. And then a whole new world of unknown destruction with the threat of North Korea prepping to launch their missiles. It’s like we’re in a horrible movie, right? I found myself really sad and uninspired by the current events. Soul strolls help us connect to the outer world around us as well as tune into the depths of our own inner selves - our souls. My walks this week were like medicine that calmed me down and restored my faith in our planet. They were moving meditations that provided an outlet for the fears and sorrow to move through me and not get stuck and take up permanent residence inside my mind. I’m not an earbuds kinda girl and prefer to do many things with no background music or podcast in my ears so I listen to nature and traffic. Since I’ve moved back into Manhattan and it is freakin’ SPRING outside, I have been taking a lot of strolls! I average about 12,000 steps a day - close to 6 miles! Walking in New York is a big practice of staying present and being aware. For me, it’s a way to dissolve worry and fear because I’m only thinking about what is in front of me, one step at a time. One of the places my feet carried me was the flower district! If you find yourself near west 28th street between 6th and 7th avenues, treat yourself to this mini oasis in the big bad city. 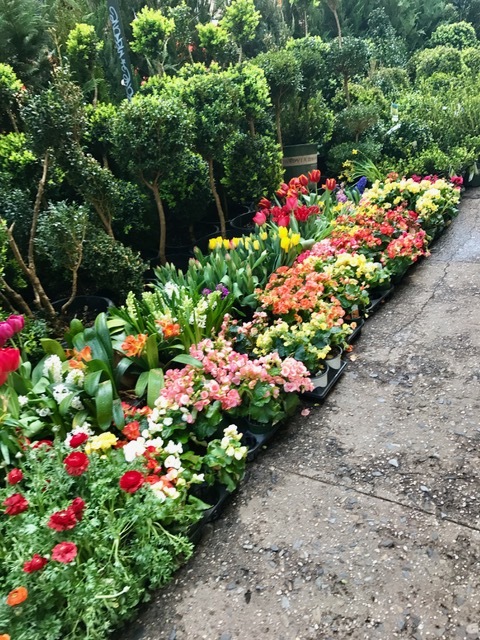 It’s flower therapy, aromatherapy, color therapy…the world may be falling apart at the seams, but its flower game is still strong. The garbage and noise of the city are muted by this gorgeous stretch of sidewalk. Before the flower district came to be, many of the plant and flower wholesale and retailers would sell their wares from a dock off east 34th street. Pushcart vendors would gather to buy and sell the flowers being shipped across the river from Long Island. In the 1890’s many of the vendors found a richer clientele on west 28th street so they moved their operation. The New York Times says that in 1977 more flowers were being bought and sold in New York than anywhere in the world except Amsterdam! I mean, look at those beauties! I felt like I was in the black and white part of the movie The Wizard Of Oz and then all of a sudden I landed in technicolor Munchkinland with all of the flowers. The bright colors didn’t take away the truth of what is happening in the news or the reality of impending World War III, but it gave me a better perspective. It reminded me to keep going inside my own heart and soul for comfort. And to 'put myself in the way of beauty' (thank you, Cheryl Strayed) every chance I can get. Aside from the spring flowers, there is spring produce! These purple asparagus would have felt right at home in the flower district. When it was springtime in Australia, I created this recipe for my friends The Garden Gurus and their YourLifestyle.tv digital magazine. I’ve been sitting on this recipe just waiting to share it with you. I’ve been grilling asparagus for a while now. But I’d heard about someone in Texas, who sugar grilled asparagus! What?! Yup, sugar. It makes perfect sense because asparagus is notoriously minerally, sometimes slightly bitter. The sugar balances it out perfectly and is a very subtle addition. Because we’re grilling, the sugar caramelizes ever so slightly, adding to the char and smoky grilled flavor. Remove the woody stems from the asparagus. Lay them out on a platter and drizzle with the olive oil, turning them around in your hands until fully coated. Dust them with sugar on all sides, season generously with salt and pepper. Heat an outdoor grill or an inside grill pan and lay out the asparagus in one layer. Place something heavy on top of the spears to apply a little pressure to them (to get better grill marks). Turn them after two minutes, grill for two more minutes until they reach the desired tenderness. As it turns out, purple vegetables don’t really hold their color that well when they are cooked, so enjoy the purple tint ahead of time!